Controversial plans to demolish and replace an Inverness community centre have been dropped following a campaign by concerned locals. Highland Council confirmed yesterday that it had decided not to continue with its bid for £2million to replace Merkinch Community Centre. Senior officials met with community representatives on Wednesday evening to discuss the plans before deciding to work together to improve other facilities in the area. The decision was welcomed by local politicians and members of the community. The council’s decision to apply for Scottish Government regeneration funding was criticised by angry residents after the authority only consulted with a small number of centre staff and community councillors. 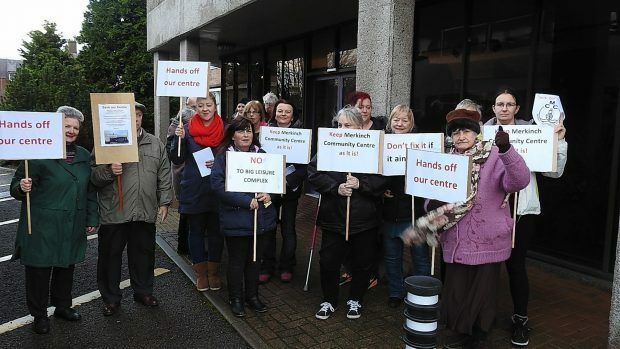 It sparked a protest outside council HQ with forms being handed over from more than 500 users of the existing facilities demanding the centre to be saved. This week’s crucial meeting was chaired by Bill Alexander, the council’s Director of Care and Learning. Afterwards he said, “Last night’s meeting reinforced the aspirations of community organisations across Merkinch for enhanced local facilities. “It recognised the concerns of users of the community centre about potential disruption to their current activities, and also that there are needs and aspirations within the community that cannot be met by the existing local services. The council will now consider other sites for the building of a new family centre and sports facilities elsewhere in the neighbourhood. Anne McCreadie, chairwoman of the centre’s management committee, said: “It was a very good meeting and a very positive result. City centre councillors had also raised concerns about the plans. Councillor Richard Laird said: “I am relieved that the uncertainly surrounding the future of Merkinch Community Centre is now over. Councillor Bet McAllister added: “This is a huge relief to the hundreds of people who use its services weekly and to those who have so resolutely fought the plan.